Attempts to explain what is meant usually get bogged down after just a few paragraphs. So how about explaining the idea using examples? Great idea, but really telling, convincing examples can be hard to find. Now listen. 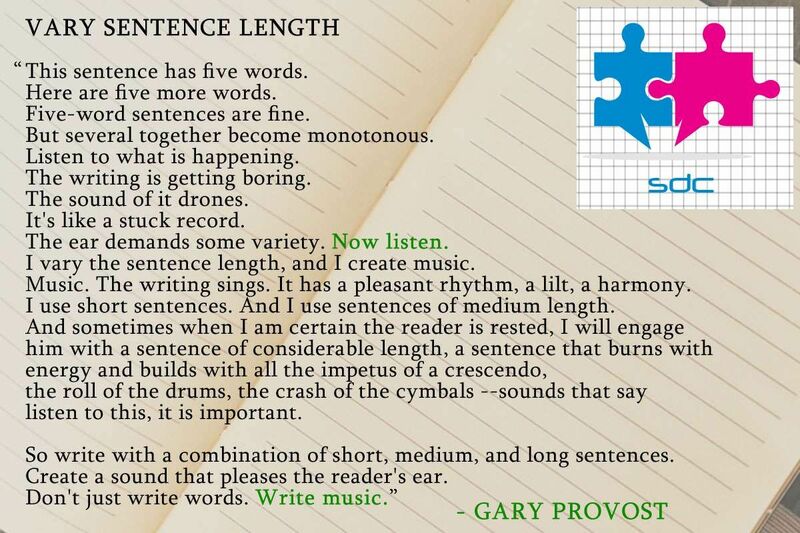 I vary the sentence length, and I create music. Music. The writing sings. It has a pleasant rhythm, a lilt, a harmony. I use short sentences. And I use sentences of medium length. And sometimes, when I am certain the reader is rested, I will engage him with a sentence of considerable length, a sentence that burns with energy and builds with all the impetus of a crescendo, the roll of the drums, the crash of the cymbals–sounds that say listen to this, it is important. To hear it read with aplomb, try this. For information on Gary Provost (1944-1995), see here. Now all I need is similarly convincing examples from the worlds of technical journalism and translated technical journalism.